I know what she means; a crime thriller should not be comfortable reading. I replied: “Okay, discomfort with familiar characters”. I finished the book that same day, but sat back and considered what made me feel comfortable with this series of books. Firstly, the quality of the writing. 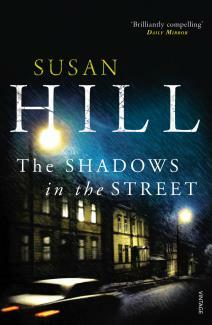 Hill’s detective Serrailler is a literary gem, he is distinctive but believable, seems ordinary but is extraordinary. And he is surrounded by a close-knit family whose stories I also follow from book to book. Hill is particularly good at creating mood – a skill also used in her ghost stories – and her description of place is minimal but so effective. For example, “It was a damp, mild October night with a thin mist drifting away over the black water of the canal like a spirit departing a dead body. The air smelled green.” And there is depth to her writing, literary and cultural references there for you to delight in recognising but which don’t matter if you don’t get them. In Lafferton, two prostitutes are murdered. Simon Serrailler is on sabbatical leave on a remote Scottish island. A librarian takes food parcels to the prostitutes, one of whom is beaten up by her boyfriend. As usual with Hill’s books, each new chapter makes you want to devour the book in one sitting as she lays out first one possibility then another. Of course nothing is as it first seems.